Presenter 5. Now in 4 editions. to suit your purpose, organisation and audience. Presenter 5 is a powerful presentation software package that takes your multimedia display to the next level. Song lyrics are plain TXT files that can be edited within Presenter or via your text editor of choice. 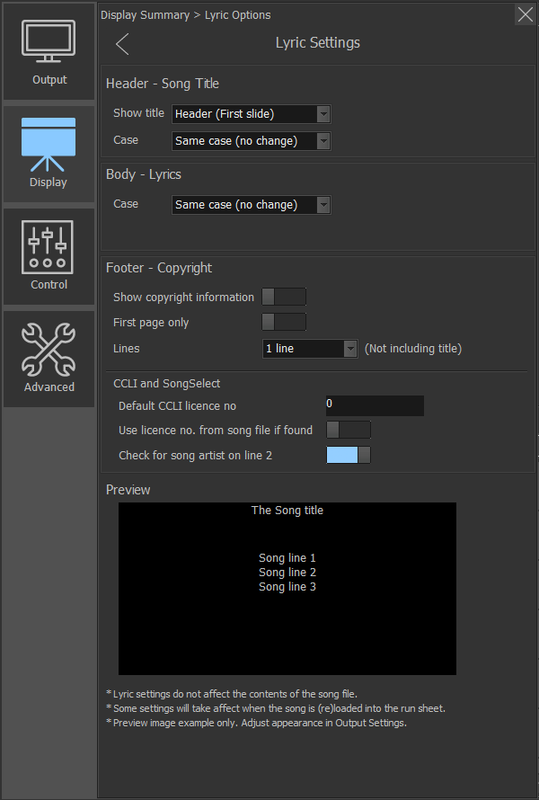 The format of the song file is fully compatible with CCLI SongSelect. Several hundred songs from Hillsong, PlanetShakers and other sources included in the installation package along with many more available on our download page. You can review and compare the Features or Pricing of each edition to see which option will suit your requirements. Feel free to browse the image gallery for samples of the control window, settings and output appearance. Presenter 5 Personal Edition provides a simple, no fuss solution for operating song lyrics on a secondary monitor or projector system. Using the extended desktop feature of Windows, an operator can build and manage a “run sheet” list of songs and have full control of the output in real time. Thumbnail slides are generated based on the simplicity of text files with text separated with blank lines. The appearance is configured in one central location and changes apply instantly to all subsequent output. The Personal Edition is provided free of charge with registration. Presenter 5 Express Edition provides a simple solution for displaying song lyrics with optional background images on a secondary monitor or projector system. The Express Edition builds upon the simplicity of the Personal Edition by allowing background images, customisable styles and copyright support and spell checker. Presenter 5 Standard Edition builds on the Express Edition with many more features and media options, including video, PowerPoint and Bible Scriptures. An additional display output is supported for stage/foldback feed, providing lyric display (typically in a large font), along with digital clock, count-up and count-down timers and media countdown timers (time-to-end for videos). All media (including messages) can be sent to either the main or stage outputs. The Premium Edition provides a complete solution for media presentation, with all the features of the Standard Edition included, plus support for up to six separate outputs. SIX! Customise your outputs with user-defined output regions, along with multiple UI support for each output. HTML, Chrome browser and YouTube support are included, increasing the possibility to (almost) whatever you can imagine! HDD: 40MB (Personal Ed) up to 200mb (Premium Ed), plus media and cache. Allow 1GB-10GB. Additional graphics adaptor/s if 3+ displays are required. Support for DirectX10 or higher. Note: Larger screens (eg. 4K) require fast CPU and graphics. Scaling factor: 100% (recommended). Max 125% supported. Internet Connection recommended; required if YouTube / Web Media items are referenced. Sign up today for our newsletter with the latest updates and information you need to use Presenter.